UTT After spending all of last week in Minnesota, UTT’s professional assessment of the enemy situation is this: the cities of Minneapolis and St. Paul, Minnesota – known as the “Twin Cities” – are in enemy-held territory. They are, at least for the time being, lost – meaning, they are under the control of a collaborative jihadist/marxist element there. The jihadi network in America is documented by UTT here, here and here, as well as in Raising a Jihadi Generation. The Islamic jihadi network in the United States includes the most prominent Islamic organizations in America, as well as most of the 3,000+ Islamic Centers/mosques, all of the 700+ Muslim Students Associations (MSAs), all of the Islamic Societies and Islamic Associations (Hamas), and a large number of the Islamic non-profits created in 1993 forward. The purpose of the Islamic Movement here – per their stated doctrine – is to wage Civilization Jihad until America becomes an Islamic State under sharia (Islamic Law). Minnesota is home to the largest Somali population in America. It is estimated that over 125,000 Somalis live there, most of whom are in the Minneapolis area. This community sent at least 22 Islamic jihadi fighters overseas to fight for the terrorist group Al Shabaab, although some estimate the number is closer to four dozen. The Cedar Riverside neighborhood is also called “Little Mogadishu” in reference to Somalia’s capital. Some Minneapolis residents feel parts of their city have become like a third world nation. Inside a 10 mile radius of Minneapolis city-center, there are at least 29 Islamic Centers/mosques, and an unknown number of home-mosques. The Twin Cities area is home to Hamas organizations including CAIR and Islamic Associations. The Muslim Brotherhood’s Muslim Students Associations (MSAs) are on at least 21 Minnesota college and university campuses. There are MSAs in at least 11 Minnesota high schools recruiting jihadis and turning public opinion towards the Palestinian Cause (Hamas) and away from Israel. Other Muslim Brotherhood (jihadi) organizations in and around the Twin Cities area include the Islamic Societies in Woodbury and Willmar, the Muslim American Society (MAS), and others. The Twin Cities is home to the first official organization representing Al-Azhar University in Egypt -the Islamic University of Minnesota (IUM). Al-Azhar is the oldest and most authoritative school of Islamic jurisprudence on the planet. At IUM students are taught that killing Jews, waging jihad, and imposing sharia on the world are obligations for all Muslims. Minneapolis and St. Paul are also home to the Minnesota Dawah Institute. This Institute focuses on spreading Islamic Dawah, the call to Islam, a mandatory requirement before jihad can be waged. As a result of this invasion of Minnesota, the average Muslim on the street wants to overturn U.S. law and live by sharia. 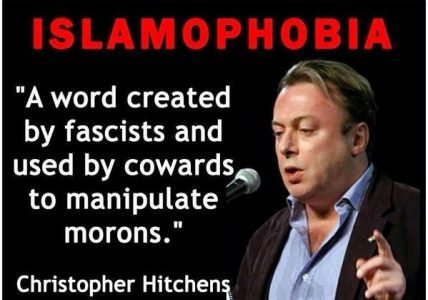 This includes the open support of killing people who mock Mohammad, Islam’s prophet. For a realistic view, see the Ami Horowitz short video on the streets of the Muslim Cedar-Riverside neighborhood of Minneapolis, also known as the “West Bank” of the University of Minnesota, HERE. Without exception, elected officials in the Twin Cities’ area have not only surrendered to local Islamic leaders, they are using the force of their positions to silence and attack Minnesota citizens who want to keep their freedom. America’s first Muslim Congressman, Keith Ellison, represents the 5th District of Minnesota, which includes Minneapolis. Ellison has been a vocal supporter of Hamas (CAIR) and the Muslim Brotherhood. 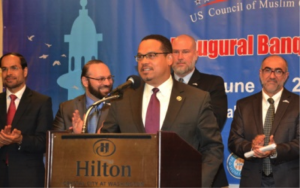 Congressman Ellison is actively working to silence any criticism of Islam or jihad here in the United States, and works directly with the first Islamic political party here, the U.S. Council of Muslim Organizations. Watch the Congressional testimony of UTT’s Chris Gaubatz HERE about Congressman Ellison’s attendance at a Muslim Brotherhood event. 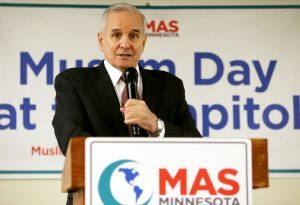 Minnesota Governor Mark Dayton made his position clear when he told citizens of that state if they do not like the growing Muslim Somali population in Minnesota they can leave. Lieutenant Governor Tina Smith is a hard-left Marxist who was the former Vice President of Planned Parenthood for Minnesota and the Dakotas. Both Governor Dayton and Lieutenant Governor Smith have forged a strong working relationship with Hamas (CAIR) in Minneapolis. 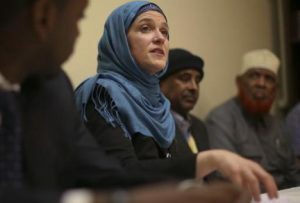 Minneapolis Mayor Betsy Hodges has bowed to the Islamic community, and advocates stopping “Islamophobia” instead of dealing with jihadi attacks in the United States and her state. Under the watch of Hennepin County Sheriff Rich Stanek, the jihadi threat has increased exponentially. There are 83 Islamic Centers/masjids/mosques and Islamic Societies in Hennepin County. 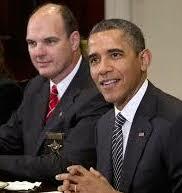 Sheriff Stanek has refused briefings on the threat from UTT, yet works with jihadis in the community. In March 2016, Sheriff Stanek and other law enforcement organizations from around Minneapolis hosted the jihadi community in the Hennepin County Public Safety Office. The message to the Muslims was that the law enforcement community would protect Muslims from “hate crimes and backlash” despite the fact FBI Criminal data shows no such threat exists in the U.S. Yet, despite the threat from increasing jihadi attacks, including the recent stabbing by a Muslim jihadi in a mall in St. 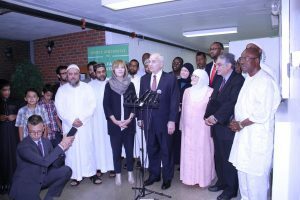 Cloud on September 17, 2016, numerous Muslims are being recruited in Minneapolis for terrorist groups, and no measures have been taken by the Sheriff to deter the threat other than outreach to the Muslim community. And…citizens in Minnesota voted for these people. It is worth noting that Minneapolis City Councilman Abdi Warsame from Somalia moved to rename three streets in Minneapolis to Somali names since a large portion of Minneapolis is now Somali. Of all the officials in Minneapolis, the U.S. Attorney, Andrew Lugar, is the most egregious example of abuse of power. Mr. Lugar does not pursue the jihadis in Minneapolis, he openly defends them and has publicly stated he will use the full authority of his office to stop “Islamophobia.” Meaning, he will squash Minnesotans free speech rights to give cover to jihadis in Minneapolis. The media in Minneapolis, including the Star Tribune, the local CBS affiliate WCCO, Minnesota Public Radio and many others, are not interested in investigative journalism or the truth. These media outlets propagate a hard-left/Marxist narrative that provides cover to the jihadis in Minnesota while keeping the public in the dark of the real dangers. UTT provided these organizations evidence from the largest terrorism financing and Hamas trial ever successfully prosecuted in U.S. history revealing CAIR was created by the U.S. Muslim Brotherhood’s Palestine Committee (Hamas) to be a Hamas organization here in America. Yet, while they called for UTT’s programs to be shut down in Minnesota, they openly defend Hamas (CAIR) and never mention any of the evidence from the FBI or Department of Justice detailing CAIR is a terrorist organization. The Countering Violent Extremism or CVE is a program created in Britain by the Muslim Brotherhood. This is a hostile information campaign and a double-agent program, and was eagerly sought after by the U.S. government. CVE’s purpose is to ensure Muslim Brotherhood leaders are exclusively used by the government as the liaison for all matters pertaining to Islam and terrorism, so the MB controls the narrative in this war. In Minnesota, the Islamic leadership took this to a new level when President Obama used Minneapolis as a CVE pilot city. 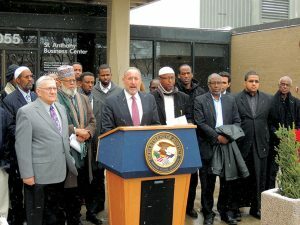 The Muslim community not only uses CVE to control the counterterrorism efforts in Minneapolis/St. Paul, they are now bashing Minnesota’s leaders for the “Islamophobia” of CVE. It is a self-sustaining circular thrashing of Minnesota’s leadership for doing what the Muslim community asked them to do. Classic counterintelligence tactics. Moreover, since Congresswoman Michele Bachmann (6th District, 2007-2015) began courageously defending the state of Minnesota against the jihadi onslaught, the federal government has poured tens of thousands of Somali refugees into Minnesota. The Southern Poverty Law Center and the Department of Justice filed lawsuits against her high school – Anoka – for “harassment” of lesbian and gay students. This is exactly the kind of targeted attack that is typical of the Marxist movement in support of jihadis across the United States. The significant Islamic jihadi network. The support the jihadis have from all levels of the government in Minneapolis, as well as the Governor and Lieutenant Governor. Minnesota citizens are nearly completely unaware of the threat or willfully complacent. Law enforcement leadership is either defending the jihadis or denying there is a counterintelligence issue. Pastors and rabbis sit silently. About JGJohn Guandolo is a US Naval Academy graduate, served as an Infantry/Reconnaissance officer in the United States Marines and is a combat veteran, served as a Special Agent in the FBI from 1996-2008, and was recruited out of the FBI by the Department of Defense to conduct strategic analysis of the Islamic threat. He is the President and Founder of Understanding the Threat (UTT).